It has become the norm for utility wind farm developers to offer some form of "community benefit" to the host and neighbouring communities to their developments. The founding land owners of Allt Dearg, believe that the Further Education of local young people offers an effective route to deliver a wider social and economic benefit to Argyll in the long term. All the owners of the wind farms contribute to the Educational Trust, including the Ardrishaig, Tarbert and Kilfinnan community partners. The Trust provides bursaries and other support to young people originating from Argyll and Bute, who are in or entering full-time further education and are living away from their family home to study. These monies are directed to young people who, for financial reasons, might otherwise be unable or unwilling to contemplate Tertiary Education, with the long term aim that such skills, experience and qualification as they acquire through education, might better equip and encourage them to become wealth creators and to make a positive contribution to the economic and social success of Mid-Argyll and Cowal. At present, Allt Dearg contributes over £30,000 per annum to the Allt Dearg Educational Trust. Sròndoire wind farm started operations in 2015 and now contributes an additional £20,000 plus to the Trust, bringing the total contribution to over £50,000 per annum. We expect this total to be topped up slightly as the Trust is a registered charity, which means that the share of donations from some of the partners at Allt Dearg is eligible for "Gift Aid" tax relief. The Trust is governed by four Trustees, and is run independently of the Allt Dearg Wind Farm and Sròndoire Wind Farms. The Trust is presently providing financial support to 60 local young people in further education. The Trust will provide £63,000 in financial support in the 2017 / 2018 academic year. We are conscious that the Trust has limited resources and cannot support all applications, and there will inevitably be disappointment for some. A copy of the Trust's latest report can be accessed here. A copy of the Trust's 2016 report can be accessed here. A copy of the Trust's 2015 report can be accessed here. A copy of the Trust's 2014 report can be accessed here. A Copy of the Trust's Memorandum and Articles of Association can be accessed here. 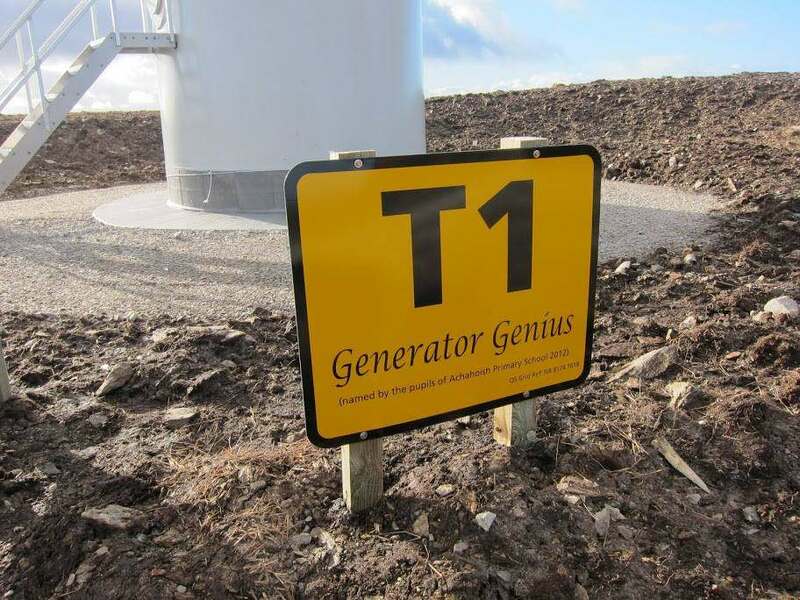 Turbine 1 - creatively named 'Generator Genius' in 2012 by the pupils of Achahoish Primary School. 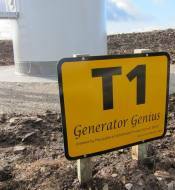 T1 is the most productive turbine at Allt Dearg.